Looking at some of the Update 10 changes... yeah, there were a lot of changes for Update 10 so I’m taking it apart one piece at a time. 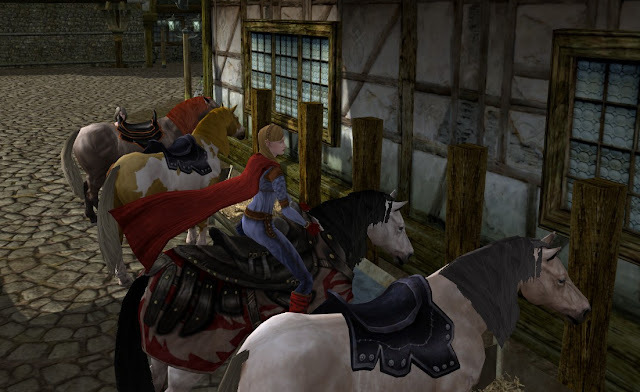 Scroll back over the articles from the past few weeks to see 1st Age LI bartering, Rohan Rings, New loot and Gear and instances, Mithril Coins and Hytbold, RK armor set comparisons, Virtues, and summarized U10 release notes. Today, I will turn my focus on LI Relics. 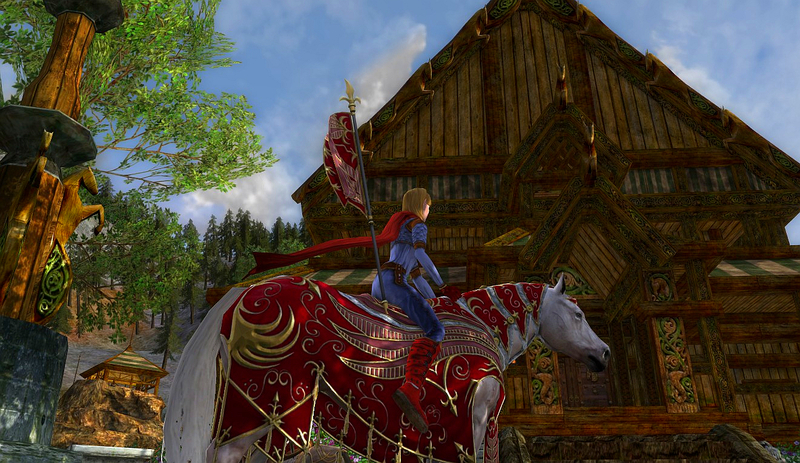 I wrote about them at Update 6 (update-6-relics-and-virtues) and then again when discussing shards (rohan-shard-queen-master-of-relics) and building a LI in Rohan (rohan-85-rk-building-li-weapon). Rohan was released since that Update 6 review and with Rohan came Tier 9 Relics and special Eastemnet (True) Relics. In the link, I showed that the relics were built on a pattern where each tier had similar relics and it wasn’t really a random collection of stuff. 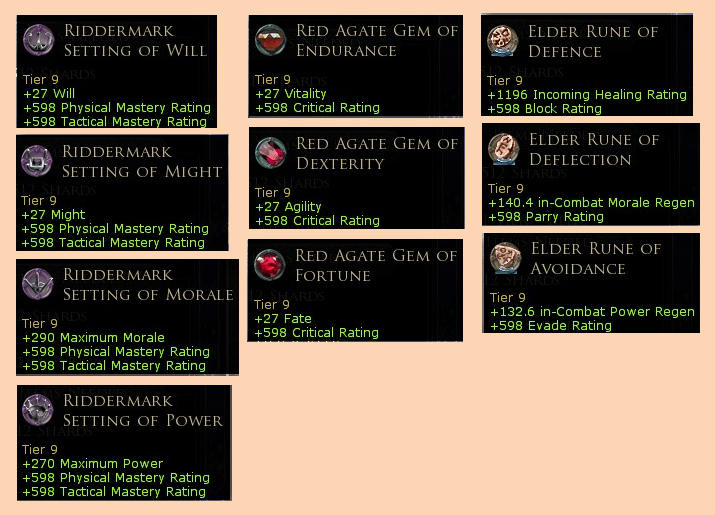 Relic naming got smarter and now for Update 10, every standard relic was renamed to make it more obvious what the relics were and how the relic progression was laid out by naming similar relics of different tiers similarly with more obvious names. Granted, the designers are still more flowery than I am. For example, they still use a name like “Red Agate Gem of Fortune” (the T9 gem for Fate and Critical) and I probably would have called it something clever like “T9 Gem – Fate and Critical”. However, it is less wordy than its previous name, “Red Agate Gem of Untold Wonders”. Tier 9 relics are reasonably easy to acquire. Three T8s combine to make a T9. Just keep plugging along acquiring relics and combining them and soon you will be rolling in relics. Until then, you will see that the T1 through T8 relics are all named similarly so you can get used to having certain relics with you. If you don’t get the T9 relic you really wanted and you have a different T9, you can meld the one you want for 512 shards + 1 T9 relic. 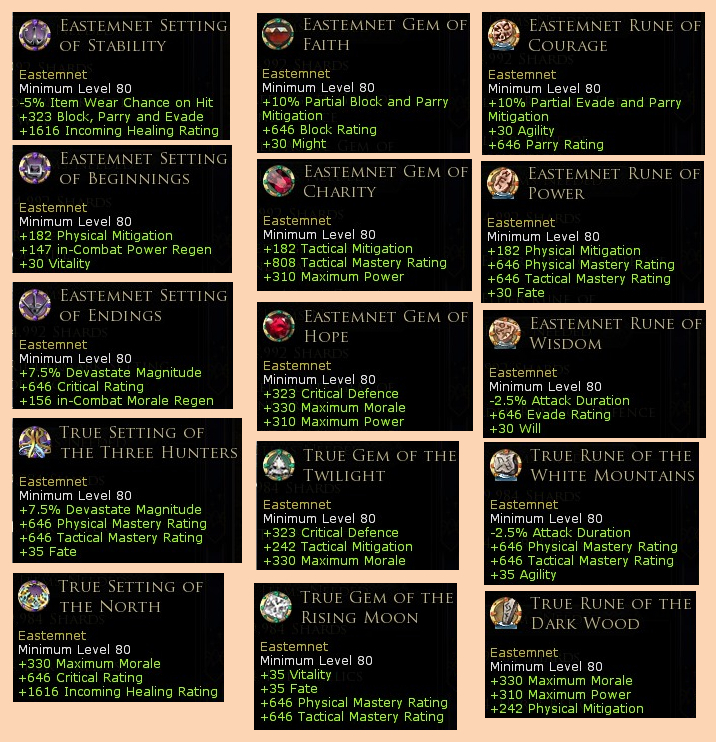 As in every tier, there are 4 Setting choices, 3 Gem choices, and 3 Rune choices. Note: I would never recommend any of these three rune choices for a RK (rune is the relic I vote most likely to upgrade to a special relic). Here are the T9 relics. The fun continues when looking at the Eastemnet/True Relics. These are special relics available for level 80+ and usable only on LIs that are level 80+. The Eastemnet Relics are obtained by melding 3 specific T9 relics + 4992 shards. The True Relics are obtained by melding 4 non-specific T9 relics + 9984 shards. It might seem like a lot, but shards are really easy to get (refer to link, rohan-shard-queen-master-of-relics). Similar to regular relics, these special relics have a sense of progression also in that you will find special relics at level 75, 70, and 65 (Westfold, Great River, Extraordinary). However, do realize that once you make a special relic, there really is no going back. They are not used in any other melding. Eventually, when it becomes obsolete, your only option is to Refine your special relic to shards. These are the Eastemnet and True Relics. Relics are a high impact way to shift your abilities. Let’s look at a few examples. Max Morale: The first example is the Relic set I chose at Update 9, which is a maximum Morale focus. One of the best ways for a RK to increase morale is to choose morale relics. Otherwise, with the gear that is available, a choice of taking a certain armor piece for its morale could have a huge impact on not getting other important aspects like Mastery or Critical. So, I chose True Setting of the North, Eastemnet Gem of Hope, and True Rune of the Dark Wood. So, what was its benefit of these three? 990 morale, 0 extra DPS Mastery, +1.7% Critical, 0 tact mit (+1.6% phys mit). Max Mastery: Here is another example. What if I wanted to maximize Mastery? 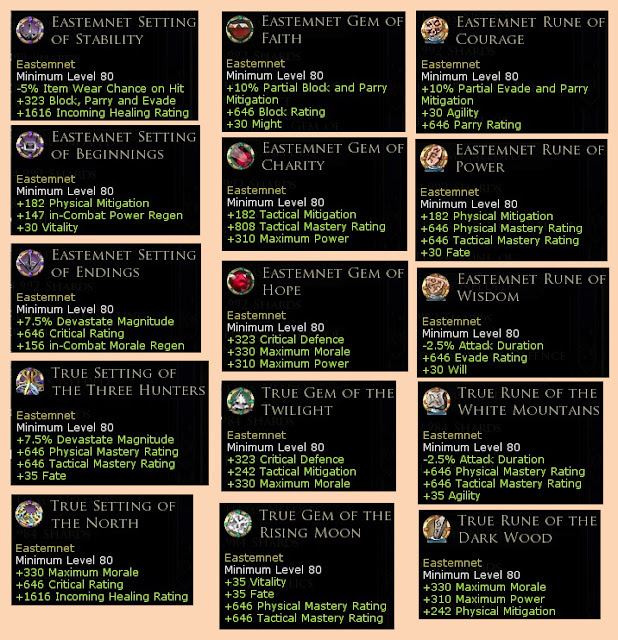 I might chose True setting of the Three Hunters, True Gem of the Rising Moon, and Eastemnet Rune of Power. The benefit? 0 Morale, +6% DPS Mastery, +0.5% Critical, +0.7% tact mit (+1.5% phys mit). And, +7.5% devastate magnitude. A Mix: Since you have two LIs, you can push the limits even further. From above, on one hand, +2000 morale, or on the other, +12% DPS Mastery, or you could split the difference… and take max morale on one LI and max dps on the other LI. A good blend of one set of three might be the True setting of the north, True Gem of the Rising Moon, and Eastemnet Rune of Power. 435 Morale, +4% DPS Mastery, +2.1% Critical, +0.7% tactical mitigation (+1.7% phys mit). 371 Morale, +3.8% DPS Mastery, +1.8% Critical, +0.6% tactical mitigation (+1.6% phys mit). As you can see, there are multiple ways to bend the relic sets to do great things. What you don’t want to do is just randomly throw relics at your LIs. My best advice is to set a goal and work toward it! Happy Riding! Thanks so much for the posts. This post and others have saved me lots of valuable time and given me good insight about stats/traits/LIs/relics. 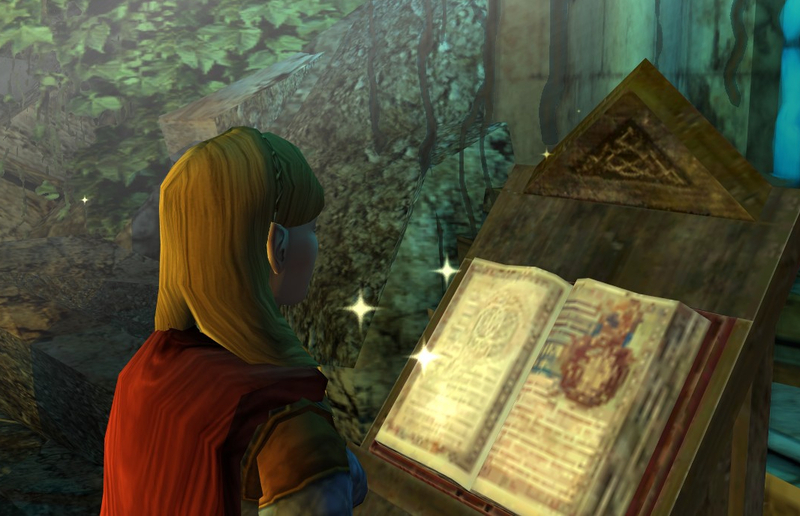 Your sight has become a very valuable resource for the RK. I love the layout and the suggestions (it makes it way easier than wading through the relic master screen). As a healing RK I was planning on using the Eastment Gem of Charity for the extra Mastery and use the True Rune of the White Mountains for the -2.5% attack duration (which hopefully applies to heals). Attack Duration does not affect "Fast" skills or "Immediate" skills, nor does it change Cooldowns or Induction times. What it does do is change the timer-between-skills fired consecutively. So, what we are looking for are skills that do not have inductions or CDs that are not labeled Fast. For healing, there is one, Prelude to Hope. With a -2.5% attack duration, you can spam Prelude 2.5% faster than other people. I am not sure that is a big win though. What that rune IS useful for is that several of the lightning skills can be spammed quickly. If you were in an occasion to where you needed to fire off Ceaseless Argument (and a couple others) many times in a row, you actually can improve your DPS by 2.5%, which is a better dps improvement than the mastery rune, when you use those skills. 1st Age LIs, Rohan healing rings, fans!